Successfully Added MP4 + MP3 Player with Deluxe Car Adapter Kit (4GB) to your Shopping Cart. MP4 + MP3 Player with Deluxe Car Adapter Kit (4GB) for fun in and out of the car! If you're looking for a better way to enjoy your music while you drive, then look no further. This MP4 / MP3 player with FM transmitter lets you play your own selection of favorite music and movies anywhere you go. Listen to your tunes or watch videos while the audio plays directly through your vehicle's stereo system. Your songs, your car, your stereo system: what could be better? No special setup is required to use this MP4 + MP3 player in your car. Just pop the player into its car adapter and choose an FM station to broadcast to. That's it! You can now listen to all your favorite tunes straight from your car speakers. With 4GB's of memory, you'll have plenty of room to store all of your favorite jams. If you need more space, just pop in an SD memory card. Easy to read menus and simple navigation let you can keep your hands on the wheel and your eyes on more important things, like the rear fender on that hottie in the next lane. When you reach your destination, just plug in the premium quality earphones and slip this MP4 + MP3 player into your pocket. A thin profile and long battery life let you enjoy your music and videos long after you leave the car. Attractive design, ease of use, and compatibility with tons of media formats make this item great for personal entertainment or resale. Get your sample today, then order in bulk to enjoy even better discounts. From your best source for high quality, low price electronics, Chinavasion. Bonus: Premium quality gold plated earphones now included! Ultra portable MP4 + MP3 player with adapter for use in vehicles. Can transmit audio via FM transmission directly to your vehicle's speakers. Shuffle, repeat, and last song position memory. 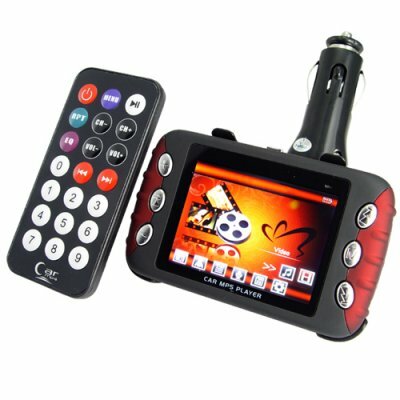 2.5 inch LCD display for viewing full screen video files. 4GB of internal flash memory. SD memory card slot for up to 8 GB more music and video files. No. You can listen to audio through the premium quality earphones, by broadcasting to an FM channel or connecting the media player to a stereo system using a jack cable. What's the big deal about these premium quality earphones? These earphones have max range bass and treble frequency response that make your listening experience much better. For more information, see here. You can use the USB cable to load music from your computer directly on to the player. If you have a micro SD card, first put the card into the MP4 player, connect to your computer and format the micro SD card. Then load your songs onto the micro SD card, and you're ready to go. How do I charge this MP4 player? You can charge the MP4 through the cigarette port adapter or directly through a USB cable connected to a computer. It's best to transmit to an FM station with no signal in your area. This way there will be no interference with the MP4 player's signal. Do you have any advice for navigating through the menus? Hold down the "M" button to go back. Everything else is easy and intuitive! This product is my second order from Chinavasion. For the price you pay its very reasonable product. The menu guide is very poor and short, not easy to understand easily as first time user. remote control works but don't expect like your tv's remote at home. the on/off button is out of my understanding I don't know what is its fuction. The important info about the settings with FM radio is also missing. The sound is not 100% clear like your FM channels. BUT Overall its OK and working its much better than your old fashion CASSETTE PLAYER and now I can listen 4GB music of my choice and I don't turn the sides of the cassette A or B. Just be careful when changing settings because It changed in CHINESE language accidently and I was shocked and did not have idea what to do next, furtunately plugged it off and on totaly and luckily appeared on screen "WELCOME" in English. Finally FM transmitter that actually works! Very reasonably priced, stylishly designed, compact, intuitive and user frendly. FLAC format support offers great dynamic sound and YouTube's .flv clips converted to .avi let you store crisp video. Charges reasonably quick and will play music up to 2 hours after disconected from power source (combined with mobile solar chargers will add almost infinite autonomy). Will not transmit without headphones attached, they act as emitter antenna too. Will not transmit while charged from PC over USB. Micro SD card supported thru adapter only. Hope that '8 GB SD card support' actually means SDHC cards support (there's no plain SD card over 2 GB) that, with internal 4 GB storage offers 12 GB capacity wich is just awesome. Small, silver switch off button on top is NOT to be turned off while disconected from power source, it will not switch back on until reconnected to car lighter or PC again. Shifting desktops, preset or custom equilizer and display showing ID3 tag, lyrics or pulsating freq. chart are just fine final touch. In short, everyone who saw it wanted one right here - right now. :) Thanks Chinavasion. on 2009-11-07 01:11:52 Slight problem with GREAT RESPONSE! The unit was impressive even though there was a slight bug within the system that forced me to send it back. Chinavasion came through though! They got right on it and fixed the bug plus reshipped it back. Chinavasion was great at helping me out! Thank you Chinavasion!